Weinheim (Germany), April 18, 2016. 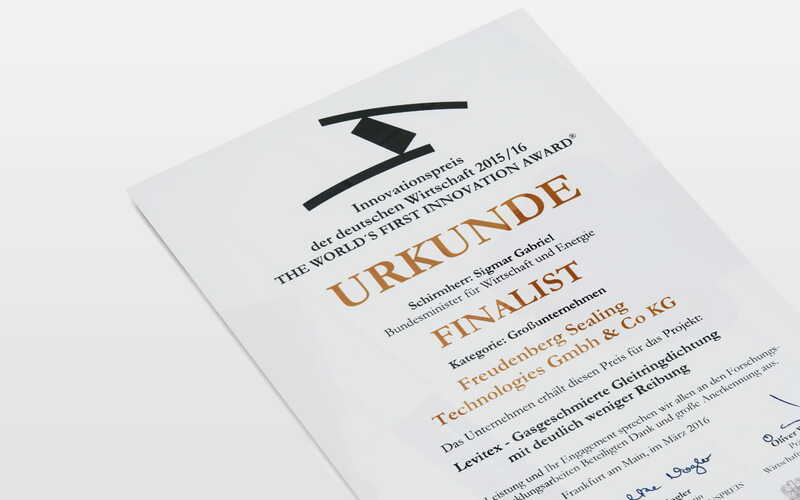 Freudenberg Sealing Technologies, one of the world’s leading seal manufacturers, reached the finals of the 35th German Industry Innovation Award. The award’s partners honored the most significant scientific, technical, entrepreneurial and intellectually challenging innovations of German industry. The award is bestowed under the auspices of Sigmar Gabriel, Germany’s Minister of Economic Affairs and Energy. The company and its gas-lubricated mechanical face seal “Levitex” made it into the final round of the “large company” category. “Levitex” is a nearly friction-free seal: Its primary ring rides on an air cushion in interaction with its mating ring, reducing friction by 95 percent compared to a conventional crankshaft seal ring. This reduces CO2 emissions during driving between 0.5 and 1 gram of CO2 per kilometer. If all the cars in Germany were equipped with “Levitex” technology, there would be annual savings of more than 440,000 tons of carbon dioxide. Mathematically speaking, that would correspond to a 146-million-liter reduction in fuel consumption. More information on Levitex is available at http://levitex.fst.com. Freudenberg Sealing Technologies has announced its new Perfect Cylinder program, to help customers reduce the manufacturing cost of hydraulic cylinders while optimizing performance and lifespan of their production equipment. Freudenberg Sealing Technologies Is Developing Materials for Renewable Fuels that Are Stable Long-Term. Freudenberg has begun supplying its innovative, lightweight BlueSeal radial shaft seals to a major Detroit-based vehicle manufacturer. Outstanding customer collaboration, product quality and on-time delivery have helped Freudenberg Sealing Technologies in North America win two coveted United Technology Corporation (UTC) Supplier Gold awards during 2018.